There will be no leopards appearing in my backyard this spring. Of that I am certain. It’s because I have Leopard’s Bane blooming (That, and leopards in Nova Scotia would be a bit of a miracle…) But it’s good to be certain. Leopard’s Bane, Doronicum orientale, is a perennial yellow daisy-like plant. Depending on what zone it is grown in, it can have a blooming period anywhere from mid-spring through fall. Here it only blooms in spring. The flower stems on this cheery little plant can grow to heights of between 12-18” (30-45 cm). It prefers the sun, with some moisture, although will tolerate partial shade. The 2” wide blossoms appear on the tops of rigid stems. The insects love them. Leopard’s Bane has a long history of use in flowerbeds. Before that it was plentiful in the woodlands and meadows of Eurasia where it originates. 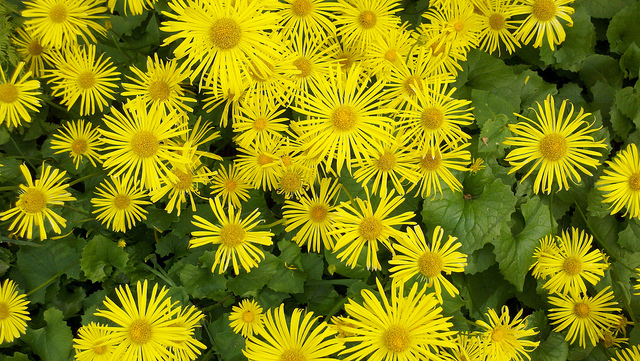 There are thirty-five species of Doronicum, but only a few are available in garden centres. Those you can buy should be available now, or very soon, in our local gardening establishments. Leopard’s Bane likes to stay where you put it, if its light and water conditions are met. It will spread if given the opportunity but is not at all invasive. 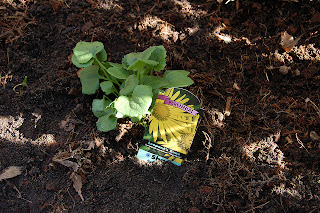 To really increase your plant numbers you have to dig it up and and divide it. Another good feature is that deer and other wildlife do not bother it because all parts of it are toxic. I wonder how animals knows what is poisonous and what isn’t? After the plant blooms the leaves continue to grow. They can get fairly large and heart-shaped with sort of sawtooth edges. Leopard’s bane also prefers cool night temperatures. It grows best in rich, organic soil because of its shallow roots. The plants in my yard have been dwindling lately. I can guess the reason why. Leopard’s Bane is an easy to grow perennial. So if you can give it fairly even moisture and some good amended soil you should have plants that you can enjoy for years to come. One last point. Don’t confuse Leopard’s Bane with Arnica montana. 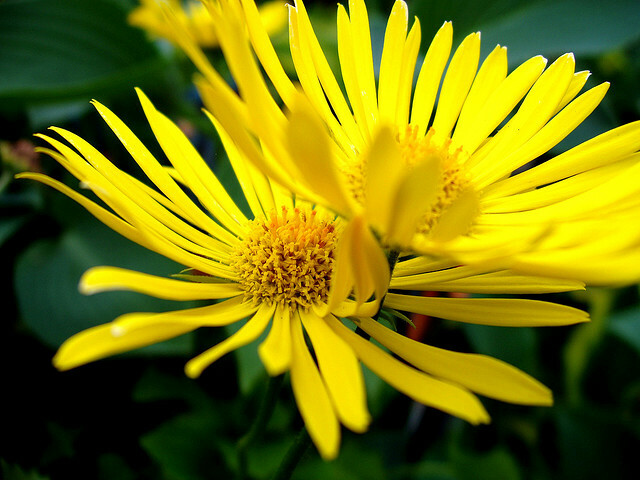 Arnica is a homeopathic plant with many medicinal uses. 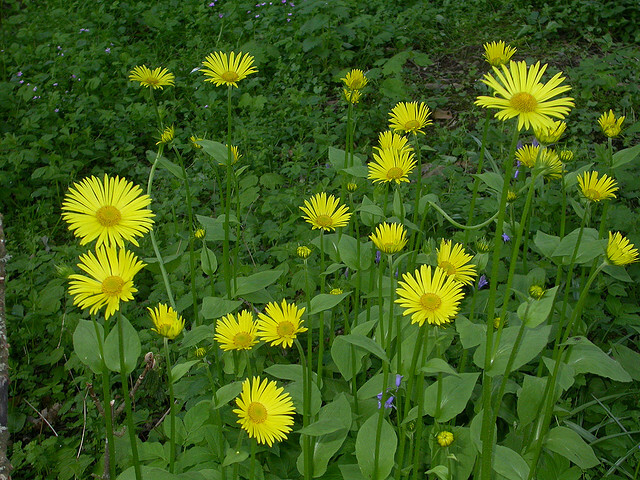 All parts of Doronicum are poisonous. The confusion arises because of a few factors: the flowers are somewhat similar, and so are many of the common names. Arnica is also called leopard’s bane, or wolf’s bane, or many other names associated with Doronicum o. by many gardeners.